stop the deportation, we are all foreigners, stop war against immigrants, stop criminalising immigrants, no worker is illegal and there is no rights for foreigners. The video material used to create this documentary of a ‘real life’ scene, is recorded by a hidden video camera. During the course of several days in the summer of 2008, the artist positioned protest banners on the streets of London and secretly recorded the unfolding scene with a hidden camera from the opposite side of the street. The scene follows this group of youngsters, who express their anger toward and mistrust of immigrants, by smashing the protest banners with the texts and slogans which support immigration and the notion of equal human rights for all. The disturbing, violent scene is accompanied with music by Beethoven, as a reference to the aestheticised violence of A Clockwork Orange and to Stanley Kubrick’s words: ‘…the only science fiction film that would be better than A Space Odissey 2001, would be a film recorded in the actual place (on our planet) where the action is happening…’. 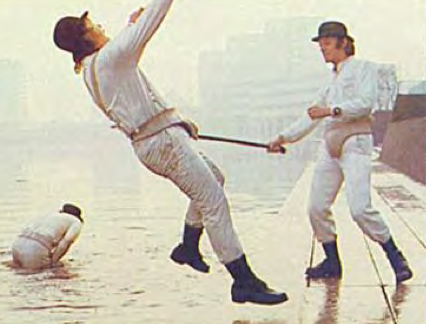 Kubrick adds, with regards to this observation, that it is probably due to the fact that A Clockwork Orange takes place in a real environment and portrays a possible reality, that the film achieves the possibility of almost becoming a part of that reality.